Голиков Владислав Юрьевич – старший научный сотрудник лаборатории радиацинной гигиены медицинских организаций. 197101, Россия, Санкт-Петербург, ул. Мира, д. 8. 1. Erkin, V.G., Lebedev, O.V. Thermoluminescent dosimeter measurements of external doses to the population of the Bryansk region after the Chernobyl accident. In: Balonov M.I. and Merwin S.E., eds. The Chernobyl Papers. Vol. 1. Research Enterprises; Publishing Segment. Richland; Washington: 1993: p. 289-311. 2. 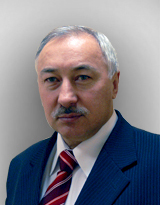 Golikov, V.Yu. ; Balonov, M.I. ; Ponomarev, A.V. Estimation of external gamma-radiation doses to the population after the Chernobyl accident. In: Balonov M.I. and Merwin S.E., eds. The Chernobyl Papers. Vol.1. Research Enterprises; Publishing Segment; Richland; Washington; 1993: p. 247-288. 3. Skryabin, A.M.; Masyakin, V.B. ; Osypenko, A.N. ; Vlasova, N.C.; Savkin, M.N. ; Grinev, M.; Lebedev, A.; Androsova, A.; Konstantinov, Y.O. ; Erkin, V.G. ; Korelina, N.F. ; Moskalev, O.S. ; Robinson, C.A. ; Prosser, S.L. ; Jones, K.A. ; Morrey, M. Distribution of doses received in rural areas affected by the Chernobyl accident. NRPB-R277; Chilton; Didcot; Oxon OX11 0RQ; 1995. 4. Jacob, P.; Prohl, G.; Likhtarev, I.; Kovgan, L.; Gluvchinsky, R.; Perevoznikov, O.; Balonov, M.I. ; Golikov, V.; Ponomarev, A.; Erkin, V.; Vlasov, A.; Shutov, V.N. ; Bruk, G.I. ; Travnikova, I.G. ; Kenigsberg,Y.E. ; Buglova, E.E. ; Shevchuk, V.E. ; Morrey, M.; Prosser, S.L. ; Jones, K.A. ; Colgan, P.A. ; Guardans, R.; Suaсez, A.; Renaud, Ph. ; Maubert, H.; Skryabin, A.M.; Vlasova, N.; Linge, I.; Epifanov, V.; Osipyants, I.; Skorobogotov, A. Pathway analysis and dose distributions. European Commission, Brussels: EUR 16541 EN: 1-130; 1996. 5. Likhtarev, I.; Kovgan, L.; Novak, D.; Vavilov, S.; Jacob, P.; Paretzke, H.G. (1996) Effective dose due to Chernobyl external irradiation for different population groups of Ukraine. Health Phys. 70: p. 87-98. 6. Golikov V.Yu., Balonov M.I., Jacob P. (2002) External Exposure of the Population Living in Areas of Russia Contaminated due to the Chernobyl Accident. Radiat. Environ. Biophysics, 41, Nr. 10, p. 185-193. 7. Golikov V., Balonov M., Erkin V., Jacob P. (1999) Model validation for external doses due to environmental contamination by the Chernobyl accident. Health Physics, v. 77, Nr. 6, p. 654-661. 8. Golikov V., Wallström, E., Wöhni, T., Tanaka, K., Endo, S. and Hoshi, M. (2007) Evaluation of conversion coefficients from measurable to risk quantities for external exposure over contaminated soil by use of physical human phantoms. Radiation Environ. Biophysics, 46, Nr. 4, p. 375-382. 9. Roed, J., Lange, C., Andersson, K.G., Prip, H., Olsen, S.,Ramzaev, V.P., Ponomarjov, A.V., Barkovsky, A.N., Mishin, A.S., Vorobiev, B.F., Chesnokov, A.V., Potapov, V.N., Shcherbak, S.B. Decontamination in a Russian settlement. Roskilde, Denmark: Rise National Laboratory; Risö-R-870 (EN); 1996. 10. IRPA-10 – 10th International Congress of the International Radiation Protection Association. Wallström, E., Thornberg, C., Vesanen, R., Zvonova, I., Jesko, T., Erkin, V., Wöhni, T., Cederblad, A., Mattsson, S., Alpsten, M., Golikov, V., Balonov, M. Assessments of effective dose to population groups in Sweden and Russia after the Chernobyl accident. P-11-258. In Proceedings of International Conference, May 14-19 2000, Hiroshima, Japan. 11. Методические указания МУ 2.6.1.2003-05. Оценка средних годовых эффективных доз облучения критических групп жителей населенных пунктов Российской Федерации, подвергшихся радиоактивному загрязнению вследствие аварии на Чернобыльской АЭС. – М.: Роспотребнадзор, 2005. – 19 с. 12. ICRP, 2008. Recommendation of the ICRP: ICRP Publication 103. Annals of the ICRP. 2008. V. 37, No. 2-4. 13. Методические указания МУ 2.6.1.579-96. Реконструкция средней накопленной в 1986-1995 гг. эффективной дозы облучения жителей населенных пунктов Российской Федерации, подвергшихся радиоактивному загрязнению вследствие аварии на Чернобыльской АЭС в 1986 году. – М.: Минздрав России, 1996. – 33 с.